NAIROBI –NAIVASHA/NAKURU WITH ADVENTURE BACKPACKERS. LAKE NAKURU –MASAI MARA WITH ADVENTURE BACKPACKERS. Morning game drive after breakfast, later dive to Masai Mara, lunch will be served on your way. Dinner and overnight or Similar-Mara springs camp L, D).Camping at or similar The Masai Mara is Kenya’s arguably the most famous reserve. It’s smooth grass carpeted hills and plains dotted with flat topped acacia trees are full of rich faunal diversity, fulfilling the expectations of any visitor searching the African landscape for the BIG 5. Located west of the Great Rift Valley, Mara is a natural extension of the Serengeti plains in the neighboring Tanzania. The Mara River, the reserve’s backbone traverses north to south. This course is the natural barrier crossed each year by large migratory heard of wildebeest and zebra which march across the two parks in search of pasture, crossing en route, the crocodile infested Mara River . Coupled with ever watchful predatory cats in the midst, the annual migration is a risky affair and fraught with peril. Morning and evening game drives through the Mara reserve gives you a chance of spotting a diverse array of wildlife including elephants, giraffe, black rhino, cheetah, gazelle, buffalo, hippo, various other herbivores and bird species. MASAI MARA – WHOLE DAY WITH ADVENTURE BACKPACKERS. A full day spent game viewing a cross the rich savannah grassland and rolling hills. The famous Mara is renowned for its great herds of plain game, black-manned lions, leopard and cheetah but also contains numerous elephants and virtually every type of wildlife to be found here in the Mara. Dinner and overnight at Mara springs camp or Similar. MASAI MARA-SERENGETI THROUGH ISEBANIA WITH ADVENTURE BACKPACKERS. Leave Masai Mara after early morning drive with game drive en-route to connect with our Tanzania driver guide at Isebania, for Serengeti since this is extension of Masai Mara. Dinner and overnight stay at Seronera Camp. 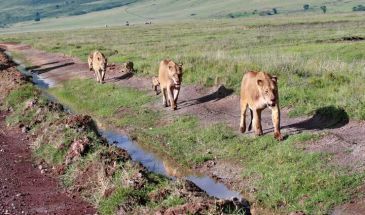 SERENGETI –NGORONGORO WITH ADVENTURE BACKPACKERS. NGORONGORO – MANYARA WITH ADVENTURE BACKPACKERS. Today we drive from Ngorongoro to Manyara. Enjoy an evening game drive in the Lake National Park whose inhabitants include hippos, monkeys, tree climbing lions, flamingos and other varieties of birdlife. Dinner and overnight at the panorama camp. MANYARA –TARANGIRE WITH ADVENTURE BACKPACKERS. TARANGIRE –ARUSHA WITH ADVENTURE BACKPACKERS. This is the last day of our trip; leave Tarangire with an en route game drive. Leave Tarangire for Arusha Arriving late in the afternoon drop you at the airport to catch your flight back at home or extent your trip to Zanzibar Adventure backpackers is looking forward to offer you a holiday for a life time. 	The optional visit to tribal villages e.g. visit to a Maasai village $ 20 PP, it’s also negitiatable with the masai chief Ballon safari in the Mara $ 450 pp-bookable before departure.